PLEX recently crested 800M and as is customary, everyone is losing their collective minds over the perceived significance of crossing some round-number boundary. I am sure I'm missing a bunch, but there is a common thread: what is the maximum price PLEX could reach? 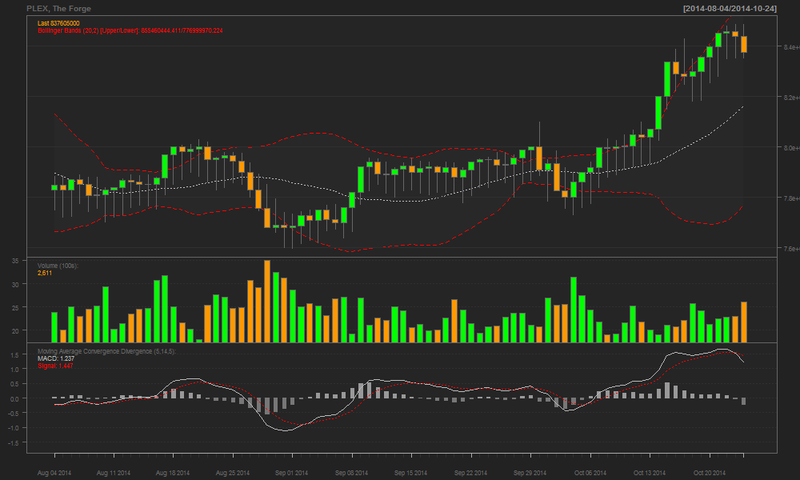 In the short term, we are seeing prices come down off their rally to 800M. I don't expect this respite to be long, and unless CCP announces a PLEX sale for Phoebe or the holidays, I can see PLEX at 1B shortly after the start of the year. PLEX behaves a lot like gold does in the IRL markets. Though it has a variety of actual uses, its value is more a barometer of fears of inflation than its actual value. People trading in PLEX are doing so because they fear that if they don't, the purchasing power of their ISK will drop because of inflation elsewhere. This becomes a self-fulfilling-prophecy, because the trend has (to date) been correct... but mostly only in the PLEX market. The speculation that PLEX is an indicator of rampant inflation is really just laughable. If we compare the price of PLEX against any other day-to-day consumable (Like the CFC Isktar) we see that general ISK inflation is basically 0. 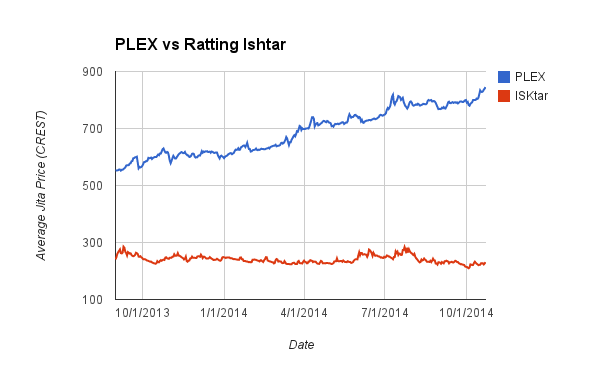 Especially using the Ishtar as base, we can draw that the value of static resources (moons) has stayed flat. Also, watching mineral prices starting to turn around since Crius shows that the general purchasing power of ISK is staying rather healthy. We only see PLEX dip in price when there is a sale or other big event pushing supply. Otherwise, the demand between people upkeeping accounts and traders hoarding PLEX far outstrips the supply of those cashing-in. I think the behavior of the PLEX market says a lot more about what people are willing to pay to play EVE, rather than anything about the macro market. When PLEX prices drop near the 3-month subscription numbers, people tend to buy a lot more... but when they are equal or greater than regular account fees, then people would rather not buy PLEX directly. Though I do expect a substantive shock when the price of PLEX crosses the 1B mark. Though I still expect the price to climb, we may see a wave of people unsubscribing. I hesitate to speculate about CCP's plans for PLEX in the long term, they may be okay with never having to deliver on the outstanding credit PLEX represents. There's a reason I've put PLEX at the front of my analysis on the Prosper show: People want to know. I've also only dedicated 2-5 minutes/wk to the "analysis" of PLEX because there isn't much to say. At this point, PLEX is not so much a general market indicator as it is a player one. It doesn't serve to track any macro market moves, instead it only works as a point to discuss "the cost of play" and "the value of loss". My major take-home for PLEX is this: it's an orouboros. People think it has value, so it trends up, people panic because it's up, and buy more. Though I believe the real "value" of PLEX is grossly overvalued, though I hesitate to call it a true bubble, because I have a hard time imagining a "pop" dropping the price back more than 10%. If you're looking for a place to park long-term value, PLEX is the tool to do it. If you're actually using your ISK through investment or play, then I'd avoid speculating on PLEX because it lacks a decent periodicity to buy-in (outside of sales outside the game). The end outcome, at least in my eyes, is the only value you're having deflated is against PLEX... The same ISK buys the same PVP equipment, or operating budget. The only value "lost" in this case is how many PLEX you could have bought with that cash. I'm not so sure people are afraid of inflation and PLEX is being used as a hedge or some sort of flight to "safety". But totally agree that it's being used as a store of wealth, similar to gold. I think there is just so much ISK floating around out there that most people don't know what to do with it all and PLEX, at its core, is a store of game time if nothing else. Concerning my prior statement about the amount of liquid ISK laying around doing nothing, one would expect it would lead to inflation. However, we aren't seeing any inflation. Probably because there really is no scarcity of resources that matter. Faucets, faucets everywhere. Sadly, liquidity is not something I can directly track. It stands to reason that there may be excess liquidity, but no other indicator is really showing it. It may be a function of lacking a thing to spend it on, but most indicators show a abnormally strong balance among most markets. High-end minerals have flatened and are trending down, speaking to an oversupply of ore/minerals. Most moon products have been incredibly stable. Probably a function of still lacking great T2 cruiser-class roles to burn moon mats on. I really think PLEX stands as an aberration, and it may be soaking up a lot of that extra cash localizing inflation to the one thing that truly counts. Thinking recent PLEX prices, which had been in the 770-800 range for a while, is probably related to re-subs ahead of Pheobe. It was 790 or so just before Eve Vegas then 845 when I got back. Something tells me some people are re-subbing alts thinking something will be happening soon. I don't think there is much relationship between core inflation and PLEX. I also don't think they are a bubble, as some others think. Too many solid underpinnings. The player base, or at least a good portion of it, have become addicted to "playing for free". Those that can, will. And the universe is pretty flush with cash to do it. I'd love to see the monthly metrics on PLEX sold by CCP. Would give a much better handle on the supply side. All we see are PLEX transacted on the markets and its just not enough info to build a highly informed case one way or another. But we're never going to see that data. I think this recent run up has more to do with it being the peak season for EVE rather than specifically Phoebe stuff. It also might be a testament to CCP's recent reactivation efforts ahead of Phoebe. Also, it could be a purely speculative drive like we saw in May. Or it could be a mix of everything. With only one view into the data (CREST), it's hard to be confident on the actual factors. And though I've had a little luck getting some very rough numbers from 3rd party retailers, I'll never get real CCP data. Gold isn't a bad comparison but I tend to think of it like this: what if gold had all it's current cultural baggage about being "inherently" valuable but _also_ some people need to eat 1 gold bar every month to live. That's plex. But now: who injects PLEX into the system? Who buys those expensiver-than-a-month PLEX from CCP? Are those suppliers enough to fulfil the (more or less) steady demand from veteran players?